The Mid-City Roscoe&apos;s on Pico Boulevard is on the move. But don&apos;t fret, it&apos;s only traveling a few yards away to a new location that&apos;s yet to be built on Washington Boulevard and La Brea Avenue, reports Curbed LA. As to why the restaurant is moving, reps told Eater LA that the new space will be more expansive; this means more seats for the customers, and more elbow room for the servers and the cooks. This is a bit of welcomed news, not because we didn&apos;t like the old Pico location, but because it&apos;s a sign that things are on the up-and-up for the chain, which had been embattled as of late. In 2015, a black ex-employee filed a lawsuit against the restaurant saying he&apos;d been discriminated against by an all-Hispanic management staff. East Coast Foods Inc., the parent group of Roscoe&apos;s, lost the lawsuit and was ordered to pay $3.2 million for damages and legal fees, the L.A. Times reported. The company subsequently filed for bankruptcy protection this year in March. Things looked so glum that Snoop Dogg quipped that he might just have to buy the franchise to save it. So this new (and improved) location is a sign that things are on the mend. 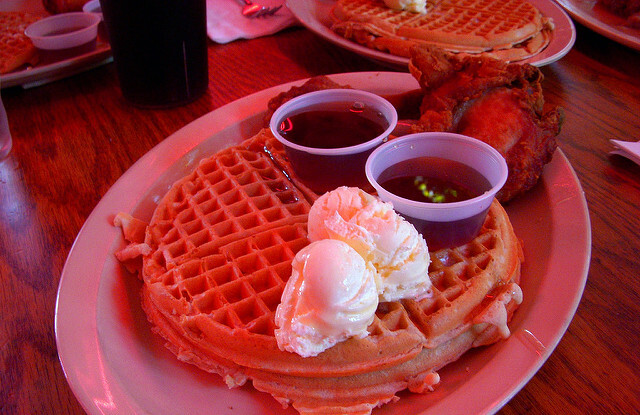 Roscoe&apos;s had even announced that they&apos;re opening a new location in San Diego later this year.